At the end of each year I do a summary post of what I read throughout the year. I find it interesting to see my reading habits, and to make note of what the best books were each year. I did better than last year but still haven't gotten back to the more than 50 per year that I am used to. I use a standard five star rating method with five stars meaning I loved the book so much I intend to re-read it throughout my life, so there are rarely any five star books. I'm happy with the new cover for my epic fantasy novel The Shard. The artwork was done by Phuoc Quan and the cover design was done by Steven Beaulieu. Our eldest left for his junior year in college today, and we head out on Monday to take our youngest to start his freshman year. We'll be empty nesters! Sad ones, though, since of course we'll miss our boys. 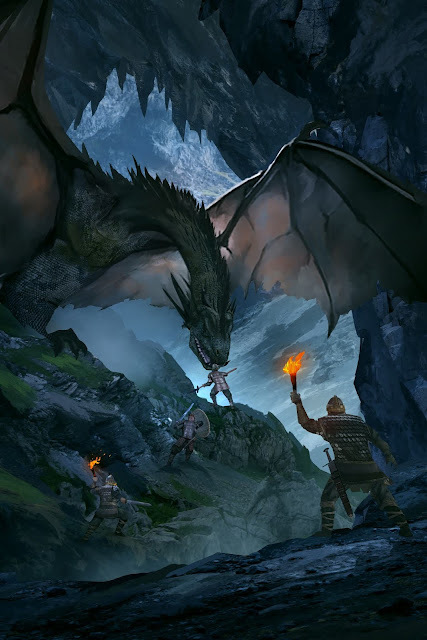 My epic fantasy novel The Shard rarely sells, despite terrific reviews, so I figured it was time to work on a new cover. I looked around for a while and stumbled across Vietnamese artist Phuoc Quan. I saw some things I really liked and thought he might be able to pull of what I was looking for. He offered a great price and full rights to the completed work, so it was definitely worth trying. Now seeing his first draft of the cover, I'm extremely pleased. It depicts and important scene from the story, where a baby dragon ambushes the party as they were passing through some caverns beneath a mountain. That dragon doesn't look much like a baby, but then the mother is much, much larger! I love what Phuoc did with the wings and how he managed to make a pitch dark cavern view-able, which can't be easy. I've asked if the figures can be moved down a bit and not yet notice the dragon, so that it can be more like the scene in the book, where only Lord Midas spots the dragon and he doesn't have time to warn anyone before it attacks. I think this is going to be a great cover, if only I can work out the typography properly. 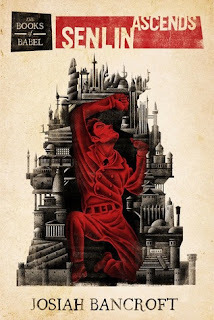 I was thinking about all the movies made from Neil Gaiman stories, and it struck me that my very favorite one--the one I truly think is the best of all of them--is the one that gets the least attention. When I see people discussing Gaiman movies, they always mention the decent but not great ones, like Stardust or Coraline, but they never mention Mirrormask. 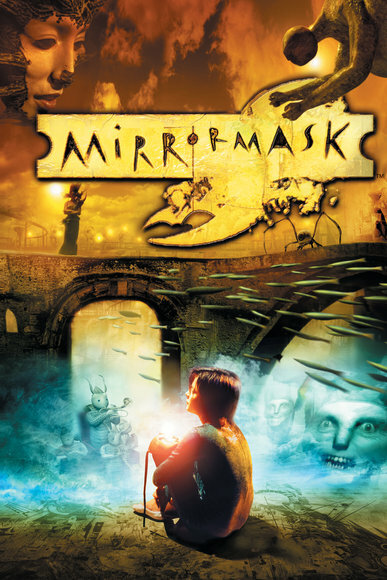 If you haven't seen Mirrormask, do yourself a favor and give it a try. It's surreal but also gorgeous and amazing. Today is the day my youngest son turns 18, and we're very proud of him. He was valedictorian at his graduation, and he's off to start Political Science at UMass Amherst this August. He got accepted to Georgetown as well, which he really wanted, but it just wasn't affordable, sadly. I don't typically blog about trade published authors. I'm not a book reviewer, so it just never enters my mind to do so. But I recently started a series by an author I'd never read, and the brilliance of the books made me think it worthwhile to post something. Usually if an author is brilliant, fans of the genre tend to hear about them fairly regularly -- Tolkien, Howard, Martin, Rothfuss, etc. In the case of R. Scott Bakker, I had heard of him, but I rarely hear him discussed in the various fantasy outlets where I hang out. This should be remedied, because he is easily one of the best fantasy authors I have encountered. I am halfway through book two of his first series, "The Second Apocalypse" (also called the Prince of Nothing series), which started with The Darkness That Comes Before. 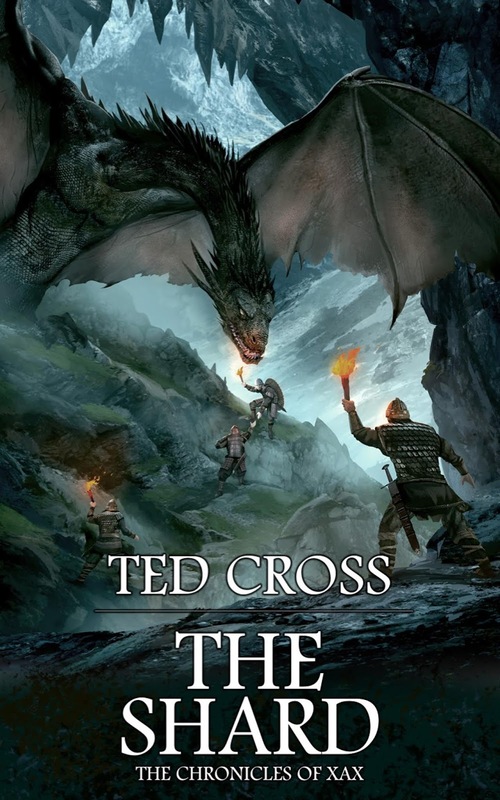 My youngest son has already finished this series and is on the final book of his four-book second series set within the same world. He loves it so much that it's the first time I can recall him demanding that I order the next books of a series. Like I said, I'm not a reviewer, so I don't want to get too far into the details of the stories. They are intellectual and take a bit of effort on your part to get invested in them, but the payoff is tremendous. 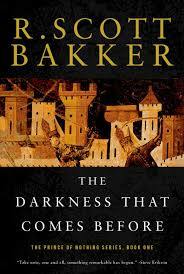 They remind me of a saner version of Steven Erikson, imaginative and vast in scope, but Bakker's work is more accessible than Erikson's is. I think it's a shame that all lovers of fantasy fiction haven't given him a try. I watched the first episode of the new Netflix series Altered Carbon and it was pretty decent. I do think the lead character was miscast, but other than that it was better than I expected. I hope it just keeps getting better. As some of you already know, I love the three books of the Takeshi Kovacs series by Richard K. Morgan, the first of which is Altered Carbon. However good the show turns out to be, I guarantee the books are even better. I especially love the second one. 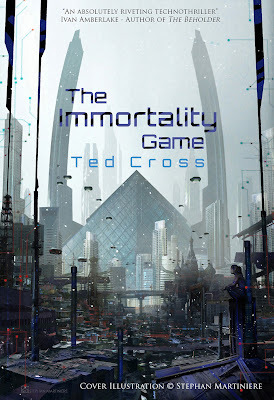 It was this series that led me to write The Immortality Game, so in a way my novel is a distant prequel to Altered Carbon. After I read the series I kept wondering what the resleeving technology must have been like back when it was first being developed. This question nagged at me for a few years, and in the back of my mind it kept percolating until I had a story. 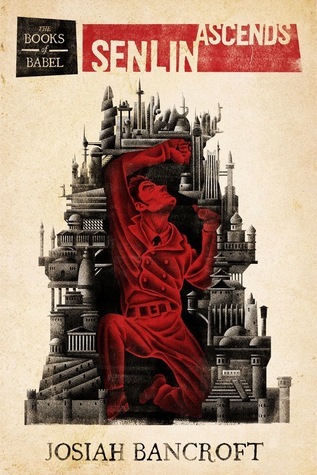 Mine is set a couple centuries before the Kovacs novels, in the year 2138. Mind/data interfaces are just being perfected and evolving into better and better models (called 'slots' at this time). There are no cortical stacks yet. That's how the technology improves in the far future. 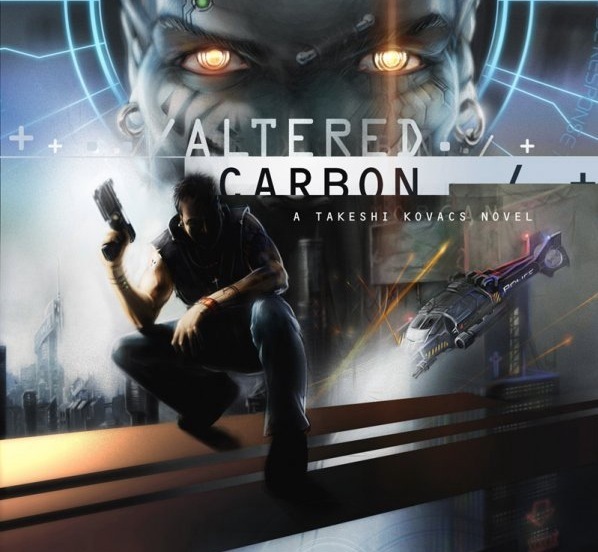 I'm happy to see that if I go to Amazon and type in Altered Carbon, my novel appears on the second page. Wish it could make it to page one, but I'm not complaining! 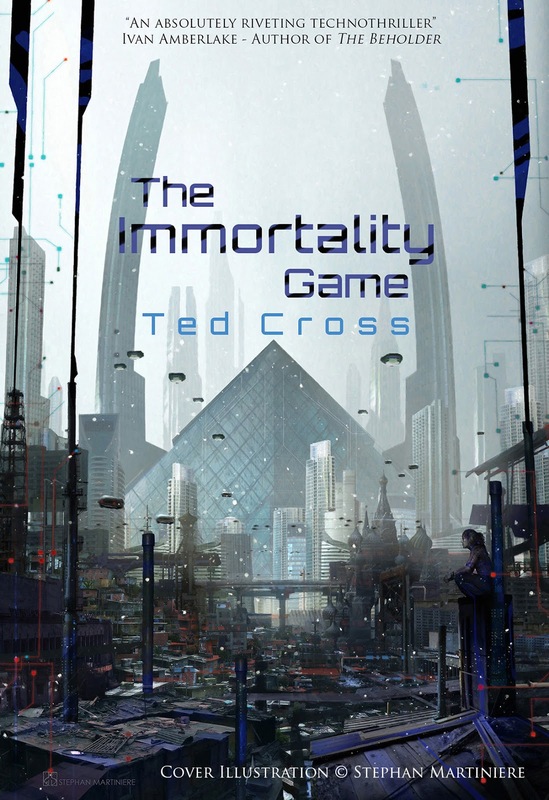 I'm just hoping some people who enjoy Altered Carbon may decide to check out The Immortality Game as well. At the end of each year I do a summary post of what I read throughout the year. I find it interesting to see my reading habits, and to make note of what the best books were each year. I read a lot less this year, unfortunately. I had been reading over fifty books a year, but this year only 35. I need to do better. I use a standard five star rating method with five stars meaning I loved the book so much I intend to re-read it throughout my life, so there are rarely any five star books. I write fantasy and science fiction. My email address is knight_tour at Hotmail.com Disclaimer: All writing on this blog is my own opinion unless explicitly stated otherwise. A month in Bali: Paradise or Purgatory? Plans Piling Up for 2019 - Science and Writing and Education, Oh My!